The scalp is an envelope of 5 separate soft tissue layers that combine to cover the skull. It stretches from the supraorbital margins on the anterior aspect to the external occipital protuberance of the posterior aspect of the skull. It contains a thick layer of skin (within which is contained hair and sebaceous glands), connective tissue, epicranial aponeurosis, loose areolar tissue, and the pericranium. The skin, connective tissue, and aponeurosis are bound together in one single unit that slides atop the areolar tissue. 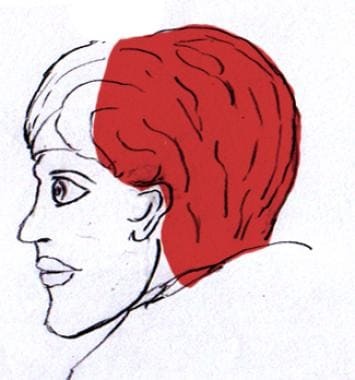 The aponeurosis comprises the underside of the skin-connective tissue unit and serves as the insertion site for the muscles of the scalp. The pericranium is a thin fascial layer fixed to the outer portion of the skull. It is continuous with the endosteum of the skull bones, so subperiosteal hematomas typically take the shape of the skull bones underlying the bleeding. C - Connective tissue & cutaneous vessels & nerves. Blood supply to the scalp comes from both the internal and external carotid arteries, and these arterioles anastomose randomly along the connective tissue plane of the scalp. Because these vessels are contained within the connective tissue, compromise of the vessels that would typically lead to vasospasm elsewhere in the body is prevented by the rigid tissue, leading to the classical large volume bleeding associated with scalp lacerations. See Scalp Anatomy for more information. The most common reason for providing anesthesia to the scalp is repair of a laceration or foreign body removal. Although some small lacerations may not require any anesthesia to repair, most scalp lacerations can be repaired using simple local infiltration of the tissues. In pediatrics, local topical anesthesia provides sufficient blockade of pain sensation to afford reapproximation of lacerations. Other, larger lacerations, or lacerations that require fine cosmetic outcomes can be anesthetized using a regional block of the scalp by infiltrating the larger nerves supplying sensation to the injured tissue. Each of these techniques can also be used for exploration of scalp wounds and drainage of abscesses, as well. Regional anesthesia is an excellent choice if multiple lacerations or foreign bodies (windshield glass) exist and is the preferred choice for wounds that require good cosmesis because the anesthesia is deposited distant from the wound site, preventing distortion of the wound edges. Regional scalp anesthesia can be used to provide relief from headaches of muscular and nervous etiology, ie, occipital headaches and trigeminal or occipital neuralgia, and is an excellent choice for perioperative analgesia in both adults and children. Very few contraindications exist to local or regional anesthesia of the scalp. Topical lidocaine should be used with great care around the eyes. Injection of local anesthetic should never be performed through infected tissue. Scalp anesthesia can be provided using both subcutaneous injections and topical solutions. Subcutaneous injections can be short-acting, long-acting, or a combination of both, and often injections are mixed with a vasoconstricting agent to help control bleeding. An added benefit of vasoconstriction is prolongation of the anesthetic action through decreased blood flow from the site of infiltration; it is this mechanism that increases the maximum doses of anesthetic medication. The most commonly used short-acting subcutaneous anesthetic agent is lidocaine, which can be given as 1% or 2% mixtures. Epinephrine 1:1000 may be added to both 1% and 2% solutions. Because of the high vascularity of the scalp, the use of epinephrine with wound anesthesia is usually considered safe. The time of injection to onset of anesthesia with lidocaine is approximately 60-90 seconds, and the effects of lidocaine typically last 20-30 minutes (up to 2 hours if mixed with epinephrine). The maximum dose of lidocaine in adults is 300 mg (3-4 mg/kg in children), when mixed with epinephrine, the maximum dose is 500 mg (7 mg/kg). 50/50 mixtures of lidocaine and bupivacaine may provide the most optimal anesthetic for certain lacerations, providing nearly immediate relief from pain from the short-acting component, and providing many upwards of 8 hours of anesthesia from the long-acting medication. Preparation for scalp anesthesia is the same as for repair of laceration or drainage of an abscess. The patient should be in a comfortable position as the procedure may take some time depending on the magnitude of the procedure. The patient should also be positioned in such a way as to make the person administering the medication as comfortable as possible. Injections should be given under good lighting to ensure accuracy and safety from accidental needle sticks. For wounds on the forehead, vertex, or temporal regions of the scalp, the patient should lie supine on a stretcher with the head of the bed positioned between 30 and 45 degrees. The bed should be elevated as high as possible to bring the wound site just below eye level for the practitioner. Patients with wounds to the posterior region of the skull and injections to treat occipital headaches should be positioned in the seated position, with the bed lowered as far as possible. The practitioner may then stand behind the patient and administer anesthesia. Another option for posterior scalp access is to have the patient lay on their side on a bed with the head lowered all the way. This manner may be more appropriate for patients who have lost a significant amount of blood, or who complain of dizziness or vertigo. For all injections of anesthetic, the skin should be thoroughly cleaned with iodine or chlorhexidine and the practitioner should wear sterile gloves. To anesthetize a laceration, first clean and sterilize the wound as tolerated by the patient. Lacerated wounds are best anesthetized by passing the needle directly into the subcutaneous tissue through the open laceration, thereby avoiding the creation of a new break in the skin. A wheal should be created on both sides of the wound. The nerves of the ophthalmic branch, including the supraorbital, supratrochlear, and infratrochlear nerves, are all anesthetized at the point where they exit the skull — the supraorbital notch. 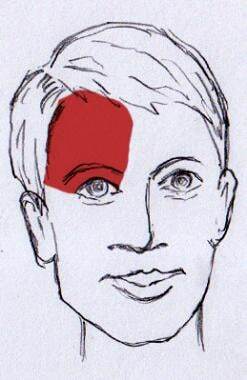 The supraorbital notch can be palpated on the ridge of the upper orbital bone in line with the patient’s pupil (when looking straight forward). Insert a 25-gauge needle attached to a syringe at the supraorbital notch. Supraorbital injection for ophthalmic nerve block. Anesthesia of the scalp requires only very superficial injection, and deep injection not only does not provide adequate anesthesia, but may actually cause increased bleeding. The most common complication associated with scalp anesthesia is hematoma formation at the site of injection. Swelling of the upper eyelid and ecchymosis around the orbit are also possible with injections in the frontal region secondary to blood and fluids traveling along the aponeurosis (see Overview). Another potential complication to scalp anesthesia is overdose, and proper dosing of medications is the most efficient method for preventing toxicity. The maximum doses for commonly used medications can be found in the Anesthesia section. During the procedure, toxicity can also be avoided by carefully aspirating the syringe before injection to ensure the tip of the needle is not in an artery or vein. Allergic reactions, infection, and failure to anesthetize the appropriate region are also complications from attempted anesthesia. (Public Domain). Grey's Anatomy Scalp Diagram. Alchemipedia. Available at http://alchemipedia.blogspot.com/2010/01/scalp-layers-anatomy-mnemonic.html. Accessed: 4/4/2011. Amsterdam, James, Kilgore, Kevin. Regional Anesthesia of the Head and Neck. Roberts, Hedges. Clinical Procedures in Emergency Medicine. 5th Ed. Philadelphia, PA: Saunders Elsevier; 2010. Vol. 1: Chapter 30, 510-512. Tetzlaff JE. The pharmacology of local anesthetics. Anesthesiology Clinical North America. 2000 Jun. 18(2):217-33, v. [Medline]. McGee, Douglas. Local and Topical Anesthesia. Roberts, Hedges. Clinical Procedures in Emergency Medicine. 5th Ed. Philadelphia, PA: Saunders Elsevier; 2010. Vol. 1: Chapter 29, 481-499. Achar S, Kundu S. Principles of office anesthesia: part I. Infiltrative anesthesia. American Family Physician. 2002 Jul 1. 66(1):91-4. [Medline]. Hogan ME, Vandervaart S, Perampaladas K, Machado M, Einarson TR, Taddio A. Systematic Review and Meta-analysis of the Effect of Warming Local Anesthetics on Injection Pain. Annals of Emergency Medicine. 2011 Feb 11. [Medline].